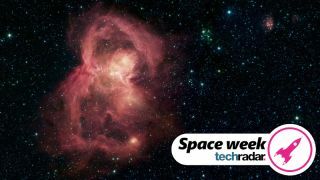 NASA's Spitzer Space Telescope has captured a stunning infrared image of a star nursery, which the space agency is calling a 'space butterfly'. The butterfly is a nebula – a cloud of gas and dust. Some nebulae are formed from the material thrown out by a dying star, but it's believed that this particular one is a region where material is being drawn together by gravity, and can eventually coalesce into new stars. The butterfly's 'wings' are bubbles of gas ejected from a dense cluster of stars (which can be seen between the wings in the image). Sometimes radiation and winds from stars cause materials to gather like this, but they can also break up clumps of dust and prevent new stars from forming. The butterfly picture is a composition of four images from the Spitzer Space Telescope's infrared array camera (IRAC) in different wavelengths of infrared light: 3.6, 4.5, 5.8 and 8.0 microns (shown as blue, green, orange and red). "Organic molecules made of carbon and hydrogen, called polycyclic aromatic hydrocarbons (PAHs), are excited by interstellar radiation and become luminescent at wavelengths near 8.0 microns, giving the nebula its reddish features," NASA explains. "Stars are brighter at the shorter wavelengths, giving them a blue tint. Some of the youngest stars are surrounded by dusty disks of material, which glow with a yellow or red hue."